Lindsay Livingston explores America’s fascination with guns and how they were put to use by the Black Panther Party. From colonial revolutionaries to holster-bearing lawmen to sensationalized action heroes, our country is enamored with guns. For Americans, guns seem to suggest a certain power, a willingness to fight and preserve liberty. Why is this? Do we revere the ability to deal death or is it just the idea of it that we love? In her recent American Studies lecture, Lindsay Livingston explored these questions in the context of one of America’s most disruptive groups: The Black Panther Party. In the Panthers’ eyes, they were fighting against an occupying force of police and legislators whose goal was to systematically oppress the black community. However, Livingston argued that, in arming themselves, the Panthers were doing more than protecting themselves and their livelihood; they were sending a unique message to the rest of the world. 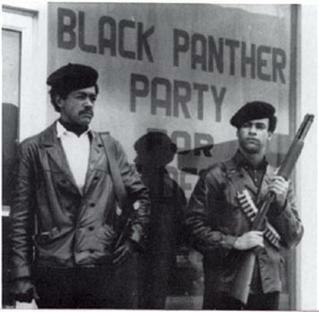 For the Panthers, guns also offered the potential for a rearranging of the racial hierarchy. To that point, guns had been one of the many ways in which power was consolidated and preserved in a system that advocated for white supremacy. When armed, the Panthers were able to utilize firearms not only as objects used for defense, but also as props for projecting their message. Livingston explained, “Guns, especially within the singularly U.S. American pervasive gun culture, constantly tread on a blurry edge between performing as theatrical things, or objects that have exceeded their representative qualities and taken on a formative life of their own and as material archives that hold within them complex histories of U.S. militarization, racialized oppression, and attitudes towards violence.” Firearms carry with them a complex narrative that makes them both an object and an archive of experience. It is through this dual status that guns transcend being an object and become elevated to a more revered state. Acknowledging the dual role of guns as weapons and as props, the Panthers set out to shoulder the burden of defending their community. It was their hope that “after the weapons had gained [people’s] attention, they would listen to the message.” Utilizing their weapons as props, the Panthers occupied the California State Capitol in 1967 in hopes of using the legislature’s cameras to protest the passing of the Mulford Act—a law created in response to the Black Panthers’ activities that would repeal the public carrying of firearms—and send a message of steadfastness and determination in the face of an overwhelming enemy. Unfortunately, their message backfired. As Livingston pointed out, “The weapons, which were meant to attract attention to—not divert it away from—the reading of the mandate, had taken on a communicative agency of their own.” Instead, white Americans, drawing on what Livingston described as “genealogies of racial fear,” did not see an assembly of patriotic defenders. “White people in Sacramento and across the country identified not the protest, but the threat inherent in the performance,” explained Livingston. Reflecting on the way their use of weapons was misconstrued, Newton and the Panthers conceded that “guns are never just props, but always, also, things,” said Livingston. As things, guns transmitted a more dangerous message. In the hands of the Panthers, a gun took on unintended meaning that involved years of racial subtext and reflected the structures of white supremacy that had limited Black gun ownership. Ultimately, this led to interpretations of the Panthers as something far different than gun-wielding colonial revolutionaries. Divided opinions concerning the Panthers and their actions suggest a telling relationship between gun ownership and race, something that the Panthers were unable to overcome in their own time. For some, an armed Black community still suggests something more militant than an armed white community, and it is this separation that continues to divide the nation today. More information about Livingston and her research can be found here. Those interested in this lecture may read additional excerpts of it here. Eric Baker covers events for the American Studies program. He is a senior pursuing a degree in news media with a minor in political science.